Perfect RSS Reader—a Google Reader client for iPad from Connect Technology—doesn’t quite live up to its name: It’s not perfect. But it is quite good. 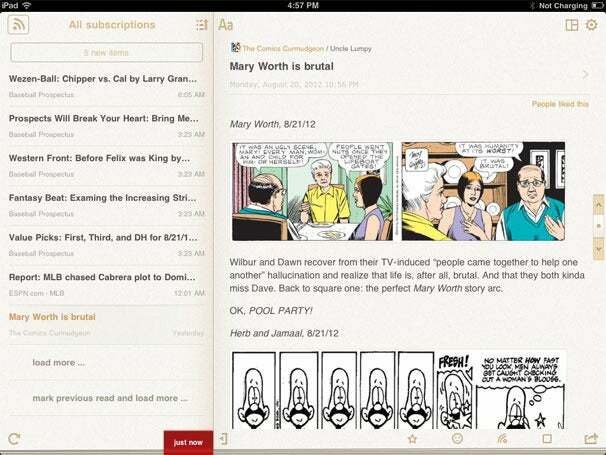 It’s strongly reminiscent of Reeder for iPad. Like that popular app, Perfect RSS Reader gives you a nice overview of unread blog posts in a “spine” along the left side of your window; the specific blog post you want to read is featured in a larger space taking the right two-thirds of the screen. Picture Perfect: Perfect RSS Reader shows unread blog posts along the left side of your screen and the specific blog post you’re reading on the right. Swipe left or right to make either panel disappear. 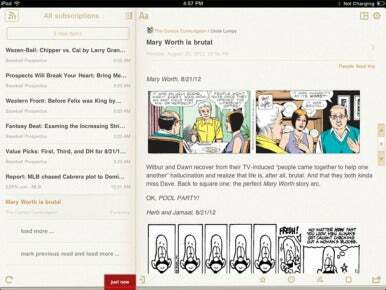 Perfect RSS Reader has several other nifty features: You can add new feeds within the app, for example. And you can choose to view a page that contains just thumbnail versions of the photos that appear in your feed. labled trial-and-error navigation for awhile before they figure out how to do so. One other oddity: The app has a “Notes” feature that sounds useful—it would be useful to jot down thoughts on blog posts—but appears to be a relic from when Google let users share items more widely. When I tested the app, the feature didn’t work. Those are minor complaints. Perfect RSS Reader is mostly easy to use and certainly nice to look at. With a few tweaks, it might even deserve its name.